HMS Sheffield (D80) was a 4100 ton Type 42 destroyer, launched on 10th June 1971 and commissioned on 16th February 1975. She was the second Royal navy ship to bear this name. An explosion during construction killed two workers, and the damaged section of hull was replaced with another section from an identical design, but in a twist of fate this ship (Hercules) was being built for the Argentine Navy. HMS Sheffield was part of task Force 317 sent to the Falklands during the Falklands War. On the 4th May 1982 she was struck by an Exocet air-launched missile fired from an Argentinian Navy Super Etendard aircraft. She sank on the 10th May 1982. On the morning of the 4th may HMS Sheffield was at defence readiness, and one of 3 Type 42 Destroyers operating as a Anti-Submarine Patrol for the Task Force. The other two Type 42 destroyers were Glasgow and Coventry. The Argentinian type 209 Submarine, which was the model originally slated to replace the South African Navy Daphne class submarines, was deemed to be a serious threat. HMS Glasgow (D88), one of the other Type 42 destroyers, detected two Argentinian Super-Etendard aircraft over 70km away and issued the warning code word “Handbrake” to all ships in the Task Force. 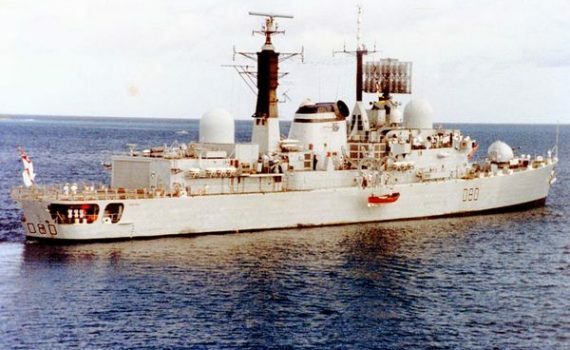 In another twist of fate, HMS SHeffield had previously assessed the Exocet threat as over-rated, and assessed this new threat as another false alarm. As a result HMS Sheffield did not go to Action Stations, launch chaff or conduct any other readiness actions. Captain James Salt was not informed of the reported threat. Communications with HMS Sheffield were suddenly interrupted. The Exocet missile fired from a ‘point-blank’ range of 6 miles by Captain Augusto Bedacarratz hit HMS Sheffield amidships, creating a 15ft by 4ft hole in the ship’s starboard side. The crew had less than 20 seconds warning. A second missile missed the target. In yet a third twist of fate, it was later concluded by a Board of Enquiry that the warhead did not detonate. This is disputed by members of the crew, and a subsequent re-evaluation in 2015 concluded that the warhead had indeed detonated by using advanced analysis tools which were not available in 1982. HMS Sheffield was now ablaze, and certain ship systems had been knocked offline, and one of the systems affected was the ventilation. The water main was also damaged, resulting in the fire mechanisms from operating at their full capability, thus effectively sealing the fate of the ship. For the next six days not only were systems evaluated for salvage, but damage control attempted to shore the hull breach. HMS Yarmouth, a Rothsay Class Frigate similar in design to the SA Navy’s President Class took the ship in tow. However the sea state during the tow caused further flooding and HMS Sheffield finally sank on the 10th May 1982. As a result of the attack, 20 members of her complement of 281 were lost, most of them asphyxiated. A further 26 were injured. Discussion points about the the superstructure and the aluminum content having a lower melting point than steel were incorrect, as her superstructure was entirely steel. 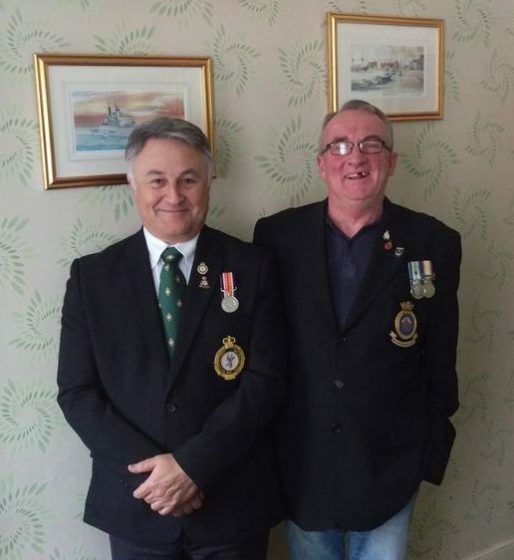 There was also a shift in the Royal Navy away from nylon and synthetic fabrics that melted onto the skin, causing more severe burns. Chris Purcell’s account of the incident.